A roast dinner is a wonderful thing, but it has its headaches – like keeping the meat moist and making sure everything is served up on time. The 5-in-1 Digital Thermometer’s probe takes simple, superfast readings, meaning you can monitor your chicken to the perfect level of tenderness. 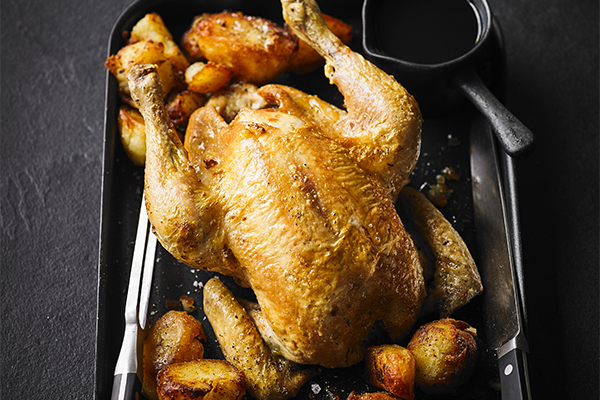 To roast the chicken, preheat the oven to 90°C. Prep the chicken by removing the wishbone and any trussing. Remove and reserve the wingtips and parson’s nose. Soften the lemon by rolling it under the palm of your hand and make several small incisions with a knife. Place the lemon and the thyme inside the cavity. Rub the butter all over the bird and season with salt and freshly ground black pepper. Place the chicken on a large roasting tray, along with the chicken wings, carrots, garlic and reserved wingtips and parson’s nose. Place in the oven for 3-4 hours, or until the thickest part of the breast reads 60°C on a thermometer probe. Remove the chicken from the tray placing it on a cooling rack set over a tray to rest for 40 minutes. Increase the oven temperature to 230°C. Place the chicken wings, carrots and garlic into a large pan and brown over medium-high heat. Add the white wine to deglaze the pan, then pour in the chicken stock and any juices that have run off the cooked chicken. Cook until reduced to a thick sauce consistency. Strain the mixture through a fine mesh sieve into a smaller pan, discarding the wings and vegetables. To finish the potatoes, drizzle the base of a large roasting tray with enough olive oil to coat the tray 5mm and place in the oven for 15 minutes. Spread the potatoes and garlic evenly out on the tray, stirring in the hot oil to coat. Return the tray to the oven for 1 hour, gently stirring the potatoes and garlic every 20 minutes. After an hour, add rosemary and thyme to the pan, tossing the mixture well. Cook for an additional 15-20 minutes until the potatoes are golden and crispy. Remove the potatoes from the pan (discarding the herbs) and place on a tray lined with kitchen paper. Season with salt. Place the rested chicken on a roasting tray and return to the hot oven for 5-10 minutes until golden and crispy. To finish the sauce, add the mustard to the reserved sauce and warm through. Finely chop the herbs and stir through just before serving alongside the roast chicken and potatoes.